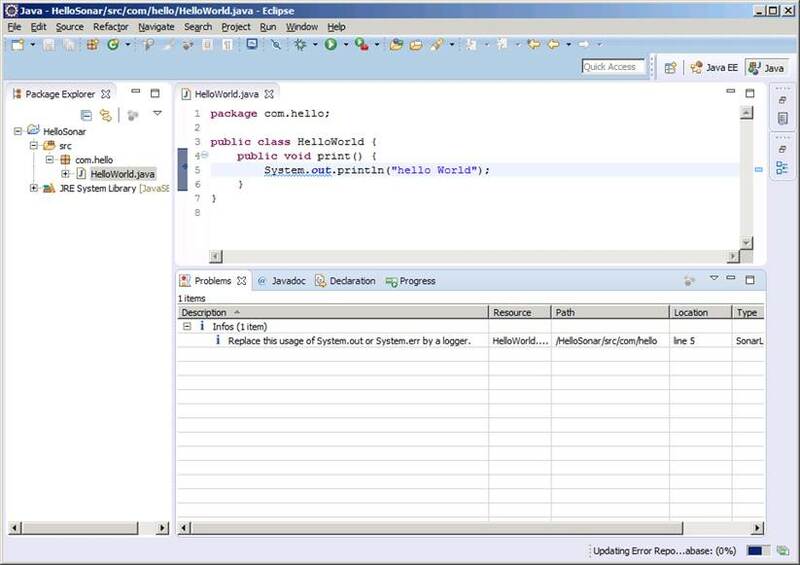 How to get started using SonarLint with Eclipse to get on-the-fly feedback on code quality issues while using the IDE. To download and install SonarLint for Eclipse from within Eclipse IDE, all you need to do is go to this page (http://www.sonarlint.org/eclipse/) and click on the “Marketplace” button which takes you to the install page. Drag and drop the “install” button into your eclipse workspace and it should start downloading and installing. Restart Eclipse and you are all set. I tested it with a HelloWorld program and got following code quality assistance. Note the information such as “Replace this usage of System.out or System.err by a logger”. Each project could set their own code quality rules (or configure rules) in SonarQube server. The project teams would then be able to validate their code using SonarLint against the rules set for that project team. The above would help the developers avoid the code quality issues much before they appear in the Sonar dashboard. Feel free to try it out or recommend it for your projects. The downside (as I have not yet tested) is that it may slow your environment because a background task always running and checking the code quality issue. However, you could disable this by right-clicking on the project and disabling SonarLint.